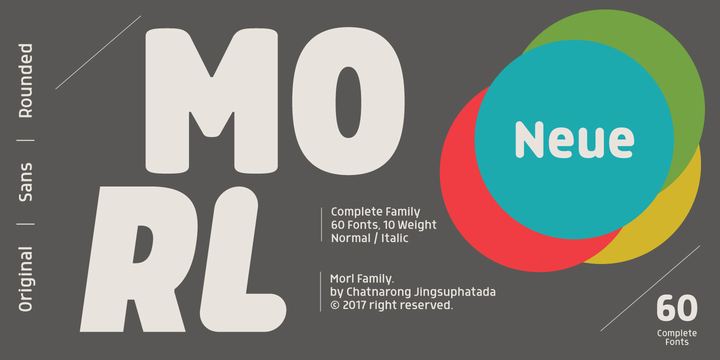 Morl is a contemporary typeface created by Chatnarong Jingsuphatada and published by Typesketchbook which is available in 60 styles, three options (Originals, Sans, Rounded), each with 10 weights (from Thin to XBlack) and italics. Morl Original has smooth corner, Morl Sans has squares corner with Ink Trap inspired and strong structure. Morl Rounded comes with rounded corner. This full fonts package is ideal for multi use. It is best for graphic design. Cannot miss it! Price: starting from $55,00 for one font to $160,00 for all 60 fonts. A font description published on Friday, October 13th, 2017 in Chatnarong Jingsuphatada, Fonts, Typesketchbook by Alexandra that has 2,808 views.